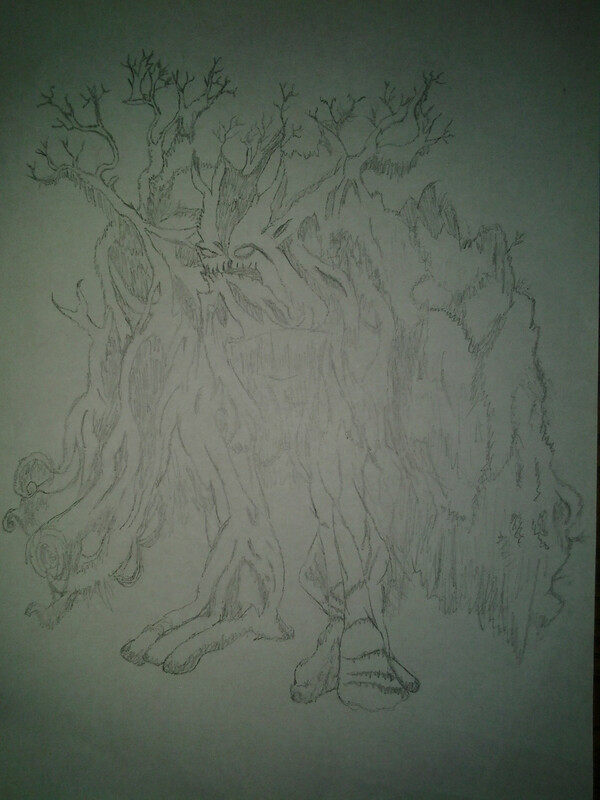 Here's some type of tree creature I drew for my computer art and animation class. I did use a reference, but it's not completely copied. Oh yea and sorry for the bad quality. The picture is really lightly drawn, so it doesn't show up as clear in the photograph. I wish I had a scanner, but I'm at my friends right now so I'm making do with what I have. Pretty cool, looks like a Dota or Warcraft creature. Kinda hard to tell what's going on with his arms though, it seems to me like too much weight for his body to handle. Nice face though, cool bug-like eyes. That reminds me of Treant Protector from Dota 2. I like that. Thanks guys. It turns out my teacher didn't even collect it, or mention anything about it. So it looks like I drew it for nothing, but hey I guess it was still fun to draw. Dude, that's pretty cool. Looks like some crazed/drugged Wizard of Oz nightmare. Does it shoot apples? Nice man, you have a talent for drawing.